Put the vodka, lemon juice, sugar syrup and rose water in a cocktail shaker with ice. Shake; strain into a chilled flute. Top up with Prosecco. 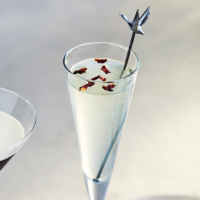 Garnish with rose petals. This recipe was first published in December 2016.